~ Children get themselves ready, remove coats, backpacks, change shoes. ~ Children choose work that interests them, and work independently, cooperatively with friends or with a teacher one on one or in small groups. ​How do you teach academics? The focus of Knowledge House education is on helping children learn how to be self-directed in order to be able learn independently through their own desire to learn. We all learn best when we are truly interested in something. Our program is unique in that we allow ample room for play and exploration in learning from our materials. We help children understand that they can learn about what interests them independently and in their own way. How does the Preschool Montessori program and its materials work? Children are naturally drawn to work with materials that they find interesting and are ready to learn from. When a child shows interest in a material or a teacher sees that a child may be ready to learn from a particular activity, a lesson in how to use the material is given. When the child is able to complete the activity, the teacher will introduce a related activity that builds on the knowledge they have already learned. In a Montessori classroom, children learn by active participation, not just through listening, watching or through group activities. Preschool children are allowed and encouraged to choose their own work materials. The Montessori teacher observes each child’s ability and readiness and introduces them to activities according to what they are ready to learn. Children are free to work at their own pace and progress as quickly or slowly as they need to. Why is there a 2- 3 year age range in your preschool programs? ​It's the Montessori way. Children of varying ages work very well together and learn quite a lot from each other. Younger children learn from observing the older children and want to try the activities they see them doing. Older children find themselves as role models for the younger children and solidify what they know and gain confidence as they teach others. Each class has a range of abilities among the children who may all be in different developmental stages. The children blend and are accepting of each other and are not singled out for being less or more advanced than others. Will you teach my child to learn to read at school? In Preschool, some but not all children will begin reading small words. In traditional Montessori education children learn to write letters before they learn to read so materials are designed to help children with fine motor skills needed for writing. At Knowledge House we teach letter names and sounds in conjunction with writing skills. 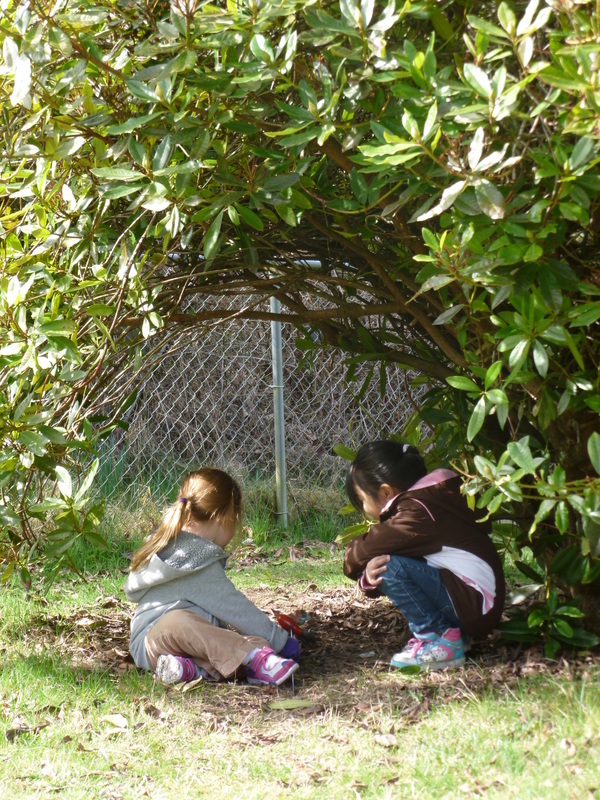 Young children are learning about language from their environment all the time. We provide an environment rich in pre-reading skills and opportunities for children to be exposed to spoken and written word and don't force children in reading. Daily exposure to written words and spoken language is the key to igniting the child's interest in and ability to read. Do you require a yearly contract? No. We accept new students throughout the year and will adjust tuition for children starting school after the first of the month. Enrollment is on a month to month basis (we don't require a yearly contract). We require a 30 day notice should you choose to un-enroll your child. If you un-enroll and wish to re-enroll, another registration fee is required. How do you handle discipline? We use natural consequences, positive reinforcement and redirection to handle behavior issues. If children have a problem with others, we help them to learn how to work it out with each other. We discuss appropriate behaviors individually and as a class. When a child has difficulty following directions, we talk with them regarding expectations and the reasons why we follow rules. If a child requires constant one on one supervision to keep himself/herself or others safe, we may discuss with parents the possibility of withdrawal from the school and trying again later when the child may be more ready for a school environment. ​Does someone live at the school? No. The school house buildings are completely dedicated to the school.